I have been invited to discuss how an understanding of Modern Monetary Theory (MMT) could assist New Zealand navigate these significant challenges and help build a prosperous future for our society. The challenges identified are climate change, technological disruption of our primary industries, and mass unemployment arising from artificial intelligence. I found the detailing of the challenges interesting given that the broad labour underutilisation rate is already at 12.7 per cent. So they have not required any robots to start marching to generate massive labour wastage. Once you exclude the dysfunctional Eurozone, New Zealand has one of the highest labour underutilisation rates within the OECD. And its neo-liberal government celebrates running fiscal surpluses. Go figure. Well you know the story. The event – Do we need a money revolution? – will be held at the Old Government Buildings, Wellington, Lecture Theatre 1 starting at 12:30 (Friday). Apparently the stream will start 15 minutes or so before the actual presentation. It will go for an hour. Apart from that I have agreed to do several interviews and meet politicians etc. The visit is being hosted by Strategy 2040. Here is some great Brazilian Afrobeat from Newen Afrobeat playing with Seun Kuti at the Womad Festival in Chile in February 2016. This song is – Opposite People – and features Seun Kuti (vocals) and Cheick Tidiane (the older guy on keyboards) who played in Fela Kuti’s band Egypt 80. Sean Kuti is the son of the great afrobeat and highlife pioneer Fela Kuti who died in 1997 at the age of 58. Fela Kuti was a musician, human rights activist and left-wing politician. He left behind a huge library of brilliant sounds. Seun is taking the music further. Here is the original from Fela Kuti – Opposite People – from his 1977 Album of the same name, with his band at the time Africa 70. I have a series of his albums queued on my iPhone playlist for the flights today! At least that part of the journey will rock. It’s an uphill fight in New Zealand unfortunately with the Labour-Greens alliance presenting its ‘fiscally responsible’ approach at a business breakfast in Auckland on 24 March 2017. High unemployment and the inability to pay for essential government services or the urgent transition to clean energy or the preservation of the natural environment or to build important infrastructure, has been STUPIDLY locked in by the current NZ opposition. As for the ruling National Party – they are of course even worse. Why in supposedly advanced countries does politics only deliver a choice between bad or even worse?? Have a look at this article from the Taranaki Daily News. I will be tuning in at 12.30 pm. Can’t wait! A friend from New Zealand, told me about ‘Rogernomics’ a few years ago which reminded me that there is barely a nook or cranny on Earth not touched by this stuff. Hopefully NZ can show what a ‘small open economy’ can actually do under the guidance of MMT. Complete and utter disregard for the underlying human and social consequences. Interesting how the employment minister at that time (Phill Goff) patronised the unemployed marchers by talking about ‘real jobs’ rather than ‘artificial ones’ ( i.e those provided by Government), this sort of crap takes me back to the 80’s in the UK when the same thing was spouted, as if the ‘market’ expressed a metaphysical reality like the laws of physics! (Sorry for my third post on watching this film -but as Bill said, the anger starts to build up as your awareness of the scams, short-termism, graft and vacuous ideology of the last 35 years intensifies). When the so called progressive parties feel they need to be as fiscally conservative as the Conservatives or even more so when they accuse them of greatly increasing the ‘debt’, all they can then realistically offer in goverment is a fairer arranging of the deck chairs on the Titanic. They have become sham parties. It appears the progressive parties feel the need to gain the permission from the ‘Deep State’ before they can be allowed to participate in forthcoming elections or otherwise they will be swatted like flies by the partisan mass media, hostile advertising campaigns and mega donations to the Conservatives. Simon, I always appreciate your insights and share your anger. I was looking forward to this lecture and was not disappointed. 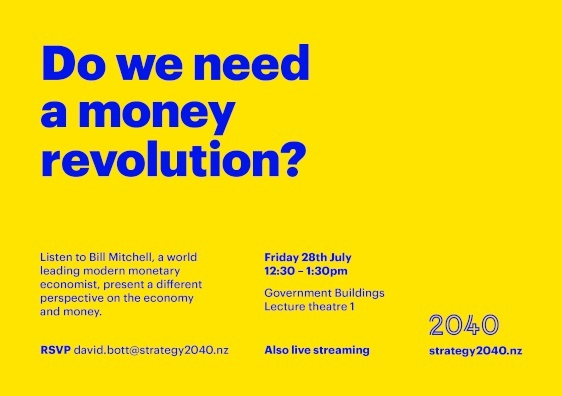 Its so helpful to understand MMT as a lens to see, understand and evaluate and I wrote a brief intro to the lecture here – http://www.scoop.co.nz/stories/HL1707/S00058/do-we-need-a-money-revolution-lecture-live-streamed.htm. Especially pleased to understand what neo-Keynesianism is all about. Also to see the graph linking with the inverse relationship between government surpluses & private debt. This seems intuitively right in relation to housing in NZ. This applies at a population level with little in the way of a public housing programme, and therefore a shortage of supply at the low end prices have risen out of control right throughout the country for renters and owner occupiers. With public austerity in public services (student loans & fees, low numbers going through surgery) then people at an individual level get indebted to become educated or to get well. It doesn’t take much imagination to see that NZ Government’s paucity of spending has deleterious impacts throughout the economy. NZ is currently embarked on a programme of so called “social investment” using intrusive collection of personal data and its sharing between agencies – big data – to reduce public services to those targetted at the most needy as well as to arrest ex students in default on student loans at the border. It is retreat from universal provision as extreme as any in the OECD and if the National Party are successful at the next election it will be rolled out through health, education,welfare and so so on. A kind of Rogernomics 2.0. One National MP said recently “You take a vulnerable child that we can identify. We can all but tell you his cell door number as an adult.” The approach is being proposed as the opportunity for a permanent reduction in public spending by viewing expensive citizens as actuarial costs to be lowered. I felt nauseous watching this. Especially at 42:50 when the Trade and Industry Minister said “We don’t see the point in imposing high costs on everyone in order to advantage the few.” With “the few” being unemployed people in poverty. What he is saying is that it’s OK for people to live in inhumane conditions and for children to starve. If he and those others like him didn’t believe that, then they would be for full jobs guarantee, basic income, a living amount of welfare – all of which impose some “cost” (I like how the video right before discussed some downsides to tariffs). Disgusting! In the end, I am ambivalent about job guarantee. I think you said it very well in your NZ lecture: MMT is a lens. If you accept the truth that (for almost everyone) the government is responsible for the involuntary able body unemployed, then you can either provide jobs, cash, or something else. There are arguments for both job guarantee and basic income, but none for the inhumane policies of “welfare recipients or unemployed are to blame for their predicament therefore we must punish them”.